Who will be OU’s starting QB in 2013? Posted on August 20, 2013 | Comments Off on Who will be OU’s starting QB in 2013? 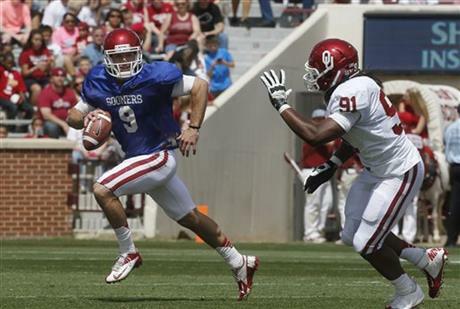 Trevor Knight in the 2013 Spring Football Game. Is the University of Oklahoma working on their Knight-moves? Are they about to release a Knight-mare on college football? Bob Stoops has said the QB competition for the starting job was real, and rumors coming out of Norman yesterday is that Trevor Knight was the leading candidate to be named starting QB for the Sooners! Both Bob Barry Jr, and Dean Blevins are saying they are hearing Redshirt Freshman, Trevor Knight is the leading QB in the race over Junior and assumed starter Blake Bell. We still have to wait on the official announcement from Coach Stoops which is expected to come this Friday. Comments Off on Who will be OU’s starting QB in 2013? The college football season is fastly approaching. This means the excitement of Sooner Football is gaining momentum! What is in store for our favorite Crimson warriors? Well that is to be determined. Oklahoma breaks onto the scene ranked #16 according to the USA Today Coaches poll and not favored to win the conference. This has only happened a hand full of times under the command of Stoops. With that said here is an ESPN preview capsule that will give you a more in depth look key player losses and returnees for the season, along with newcomers to keep a close eye on. Don’t forget to check out the key games that will ultimately determine the bowl fate of the boys from Oklahoma. Boomer Sooner and the club cannot wait to see all of you at Stoney’s, a place you can call home away from home. Club officers have been hard at work preparing for the upcoming football season. We have some new tshirts and sponsors this year that we cannot wait to share with all of you! Don’t forget my fellow Sooners the first game against the Louisiana-Monroe Warkhawks will only be aired on PPV. Kick off begins at 5pm MST. Yes, of course Stoney’s will have it!! So we will see you there!! Remember come early for prime location! Stoney’s will not take reservations!!! Just like for the crazy students at Memorial Stadium this is first come first serve only!! So get there and get ready to be rowdy for our Sooners!! Also, keep your eye out for the new food and drink specials coming out in the next newsletter. Last month we hosted our third annual Sooner Sendoff. This event is an opportunity for incoming Sooners and parents from Colorado to meet before the new school year begins. This year we had over 20 incoming Sooners attend. Altogether there were over 70 future and current students, alumni, University representatives, friends, parents and OU officers in attendance. Thank you everyone that made this evening possible. A big thank you to Tom Lorz for hosting the event as well as the Student Service office for planning it. We enjoyed meeting the future talent of OU. Best of luck to all of you in this upcoming school year! This year we are looking for talented and passionate individuals to work with our club officers to continue to make this club what it has become today and improve it for years to come. We will be holding an informational meeting for anyone interested on Thursday, August 29 at 6:30pm at Stoney’s. We will be meeting with current officers to discuss the upcoming football season and welcome anyone that would like to be more involved with the club to attend. Attached you will find a description of officer duties. There has been interest in some officer positions, but if you are interested or want more information, please emailouclubofco@gmail.com. We are excited to partner with some new and old sponsors for this upcoming football season. Watch out for an upcoming sponsor newsletter where we will highlight this year’s sponsors. If you are interested in sponsoring a game this football season, please contact us at ouclubofco@gmail.com. Join the OU Club of Colorado this coming Saturday for an afternoon of Sooner Football! We’ll have the Sooner Spring Football Game on live and with sound. Stoney’s Bar and Grill is even planning on firing up the Sooner Swirl machine so you can get that home feeling! We’ll also have our Shiner Beer & Patron Specials. Game time is 1:00 pm. Show up early and check out “Sooner Game Day” live before the game starting at 11:00 AM Mountain Time. Sorry, we won’t have the usual music & videos that we have from VJ Aaron, but we would have ended up playing “Boomer Sooner” after EVERY play! Many of you have signed up for the Stoney’s Club Cards where you build up discount amount that you can apply to your future tabs. Stoney’s will be phasing these out over the next couple of months and replacing them with the Fivestarcards.com which is a discount rewards card that you can use at several locations in Denver and even in other states! It’s free just for signing up. With Stoney’s Bar and Grill phasing out the Stoney’s Club Card we recommend our OU Club members to get down to Stoney’s and use up those Stoney’s Club balances……like….just a suggestion mind you……say….this Saturday at the OU Spring Football game Watch Party! Bench Scholarship- Available to ALL Current OU Students!!! Do you know current students at OU that could use help with tuition next year? Have them apply for our bench scholarship. This is a fun and easy way to help ease the financial burden of college! A few years ago the OU Club of Colorado purchased a bench on campus. This year we will be offering a $2000 scholarship ($1000 from the club and $1000 matched by the university) for the student that sends us the most creative picture centered/based around the OU Club of Colorado’s donated bench (located by the dorms on Lindsay St). Guidelines: We ask the pictures be in good taste and sent to ouclubofco@gmial.com. In addition to the picture, applicants will also have to fill out a short application to be eligible (essay not needed) and send in an unofficial transcript from OU. The club will post the pictures to our Facebook page and the top 3 pictures with the most “likes” will be the finalists decided on by the scholarship committee. Email us with any questions or if you would like additional information. We have been receiving many great applicants for our 2013/2014 scholarships. There is still plenty of time to submit your application to the club. We will be accepting applications until May 1st. Please check out the scholarship portion of our website here for more information:https://ouclubofco.files.wordpress.com/2012/05/scholarship-app-2013-template.pdf. Submissions can be mailed to our scholarship chair Haley Wallace or sent to the club email at ouclubofco@gmail.com. Send us an email if you have any questions.